Bossier City is the second location for the medical marijuana health clinic, Total Health Clinic. 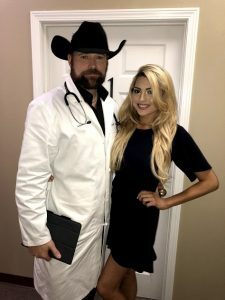 Owned and operated by South Louisiana physician Dr. Chad Rossitter, the local clinic opened last month and is located at 2310 Riverwood Drive. Rossitter said he decided to open another location because of the need for this special type of medication. Louisiana recognizes 14 conditions as approved for treatment with medical marijuana, among them cancer, glaucoma, Parkinson’s disease, seizures and PTSD. It is sold in the form of pills, tinctures, and oromucosal sprays. The clinic offers a 20 percent discount to veterans and law enforcement. According to the clinic’s website, the goal is to help people understand the use of medical marijuana is a non-addictive, non-opioid treatment. Rossitter, a board certified physician specializing in nephrology and interventional nephrology, runs the clinic with his wife, Isabella, who is the office manager. According to an article in Lafayette newspaper, The Daily Advertiser, the two met when her dad was a patient of Rossitter. A video on the clinic’s website starring Isabella, walks inquirers through the process and what they can expect during an appointment. A price guide online lists patients can expect to pay $249 for the initial visit. A third location opened in Lake Charles this month. Learn more about the clinics in Louisiana by visiting their site. Appointments and general inquiries can also be booked online through the website. Next Post:Learn More About These Bossier Events in November!